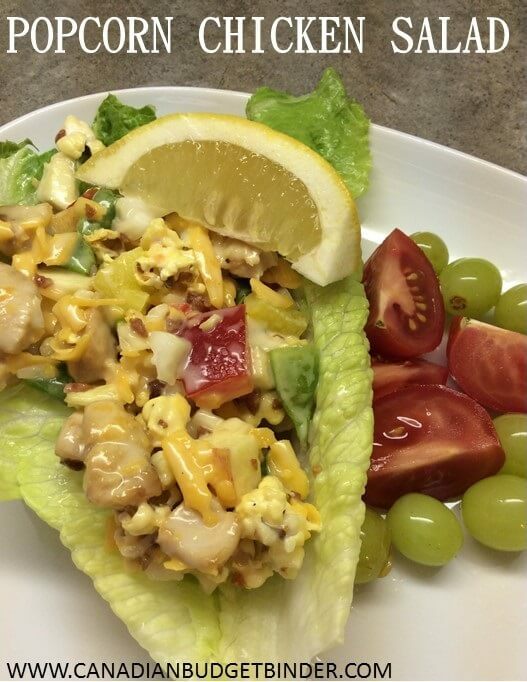 If you are a lover of Chicken Salad you will enjoy this unique twist on traditional chicken salad with the addition of popcorn served inside a lettuce wrap. What if I said to you, that you could bring a new kind of pop to your dinner table? What if your last bag of air-popped popcorn could be the highlight of your next potluck party? I know lots of questions BUT it’s leading somewhere delicious I promise you. I’m talking about enjoying Popcorn Chicken Salad in a lettuce wrap. It doesn’t get any easier and than that and it’s a light dinner. We were first introduced to this popcorn chicken salad by our neighbour and we were no, popcorn is for the movies or at home to watch your favourite program. That’s just not heard of. Popcorn chicken isn’t what you are thinking either. It’s not like the popcorn chicken you get at Kentucky Fried Chicken. It’s a moist chicken that is full of flavour and not deep-fried. There’s no harm in trying something new like I’ve done with this popcorn chicken salad. I like to serve our popcorn chicken salad exactly like the photo wrapped in lettuce with a side salad or fruit salad. You don’t always have to eat a sandwich with bread and it’s much healthier for you. When I tried the popcorn chicken salad at my neighbours my mouth was singing. I must admit it truly was delicious and I was pleasantly surprised at the texture and taste it gave the chicken salad. The popcorn added that extra boost of texture that most salads don’t offer unless you add something like fruits, nuts, croutons etc. This popcorn chicken salad is fresh, affordable and delicious. It’s also one for the kids to help out with in the kitchen as well. I always find that when the kids are interacting with you in the kitchen, preparing and cooking, they are more inclined to eat and enjoy what they made. The popcorn chicken salad can also be used as a clean out the fridge salad too. Think of all the different kinds of vegetables you can add to jazz it up and add colour. I add chicken and bacon too, just to give it even more flavour. Everyone loves bacon! The popcorn chicken salad is great with crisp lettuce, tomatoes and cucumber or even my homemade flour baps and potato skins. That next potluck you go to imagine the “Oh wow” taste factor from your neighbours and I guarantee they will be asking you to make this time and time again. So, can we hear “On the table in 30 minutes”? If you are a lover of Chicken Salad you will enjoy this unique twist on the chicken salad with the addition of popcorn. Chop chicken breast into cubes and add this into the pan with the oil and bacon. Into the bowl add grated cheese and water chestnuts. Stir until combined. Now that the chicken has cooled slightly and the bacon is crumbled add this to the rest of the ingredients in the bowl and stir. Place popcorn into microwave as per packet instructions. We usually have either salted or cheddar. In a large jug add the mayonnaise, sugar and vinegar and whisk. Another way is to use a large mason jar then just shake the jar until it has combined the ingredients. When the popcorn is ready remove all of the unpopped kernels. Then empty rest of the popcorn into the large bowl. Pour the dressing over and mix well until all of the ingredients are covered. There you have it, a chicken salad that now has attitude! A great dish for any occasion especially on these warm summer evenings. Nicola, I am actually curious about this popcorn chicken salad lettuce wraps. It seems like I really have to try this because this dish is really interesting and very new. This sure would be nice to take to a family dinner for sure!! Roughly how much popcorn does one of those bags make popped as I don’t buy the microwave stuff?? My air popper works well so I use that. Leftover pickle juice would be nice in the dressing in place of the sugar and vinegar, I do that all the time.